There are lots of ways to get up a mountain: rope tows, T-bars, chairlifts, Poma, touring gear, snow cat, helicopter. Hell the methods of getting up are nearly limitless. So if you’re about to head up the mountain in a way you never have before, here’s a little advice: watch someone else do it first. It’s pretty solid advice for just about any aspect of life, rope tows or otherwise; if you’ve never done it before, see how it’s done, then repeat. 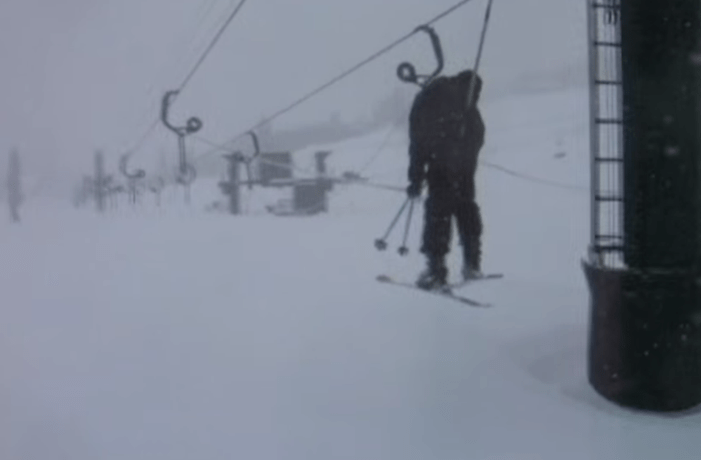 To this guy’s credit, he just straddled that rope tow and went for it. To his taint’s chagrin, he did not do it right. Not even close. Think he wondered how snowboarders rode this thing? While this isn’t a new clip, it sure is a good one that we here at Mountain Life return to every year about this time. And it ALWAYS makes us laugh. It just never gets old. There are lots of ways to get up a mountain: rope tows, T-bars, chairlifts, Poma, touring gear, snow cat, helicopter. Hell the methods of getting up are nearly limitless. So if you’re about to head up the mountain in a way you never have before, here’s a little advice: watch someone else do it first. It’s pretty solid advice for just about any aspect of life; if you’ve never done it before, see how it’s done, then repeat. To this guy’s credit, he just went for it. To his taint’s chagrin, he did not do it right. Not even close. Think he wondered how snowboarders rode this thing?